PupJoy is a subscription box service for dog owners. Its founder and CEO, Dustin McAdams, refers to these dog owners and dog parents. 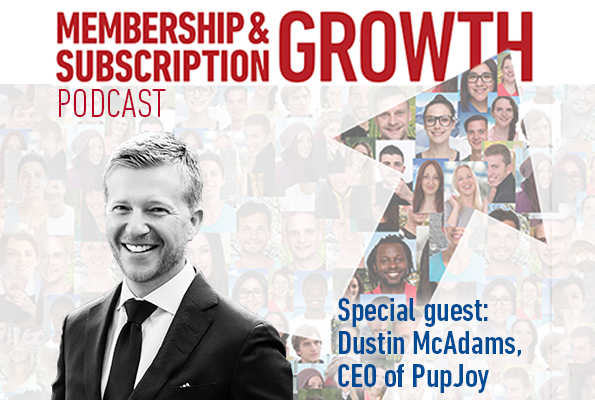 PupJoy takes a unique approach in the subscription economy by creating their business model around customization. Delighting the customer is the key to their success. Their customer service includes personalized, customized, continuity-driven, convenient services. “We curate an experience and we focus on really high-quality stuff – everything from presentation and packaging; but, at the end of the day, when we’re talking about managing the business of growth, retention, making sure we don’t have high churn, we believe customer service is very strategic,” states Dustin. PupJoy’s success goes beyond their box. “We also have an e-commerce store – a lot of replenishment items if somebody finds something in the box they love and they want more of, or larger ticket items that typically, physically or economically, wouldn’t fit in a box service.” Customers can not only enjoy their box of goodies, but they get to expand their purchase into more of what they are interested in. This is an important lesson for all membership and subscription programs; how can you better serve your customers and generate additional revenue opportunities beyond the subscription?